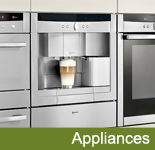 At Kirk & Ward we give honest and friendly advice with an excellent and reliable service. 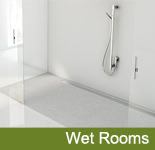 Our extensive showroom with parking, offers the latest in contemporary and classic designs in kitchens and bathrooms. The 50 years of combined experience we have acquired, helps us to help you plan, create and make real your thoughts, ideas and dreams. You’ll find the finest names and the most in depth knowledge and advice around. 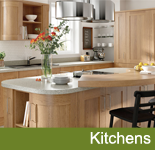 Our Kitchen and Bathroom showroom is only 1 mile from J8 M61 and 3.5 miles from J3 M65. 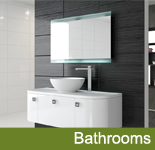 We can design, supply and in install your kitchen and bathroom. We offer free planning and design on bathrooms and kitchens and our computer designs create and help you envisage your finished room. We also do kitchen and bathroom makeovers. If you only require to refurbish your kitchen with a worktop change or wish to have your bath taken out for a walk in shower, its all part of our service. We offer both supply only or a complete installation service including plastering, tiling, electrics and decorating, We work very closely with all our fitters ensuring the installation runs smoothly. Contact us now to make an appointment for a home visit or feel free to bring along measurements for your kitchen or bathroom and discuss your options.